Errol: Btw, I’m behind on my wordcount. I think I’m 10k behind. I shall need to do a lot of writing this weekend. 😀 Fortunately, it’s guest comic time over at Debs & Errol. I’m making other people do the comics for this month. I should do that all the time! 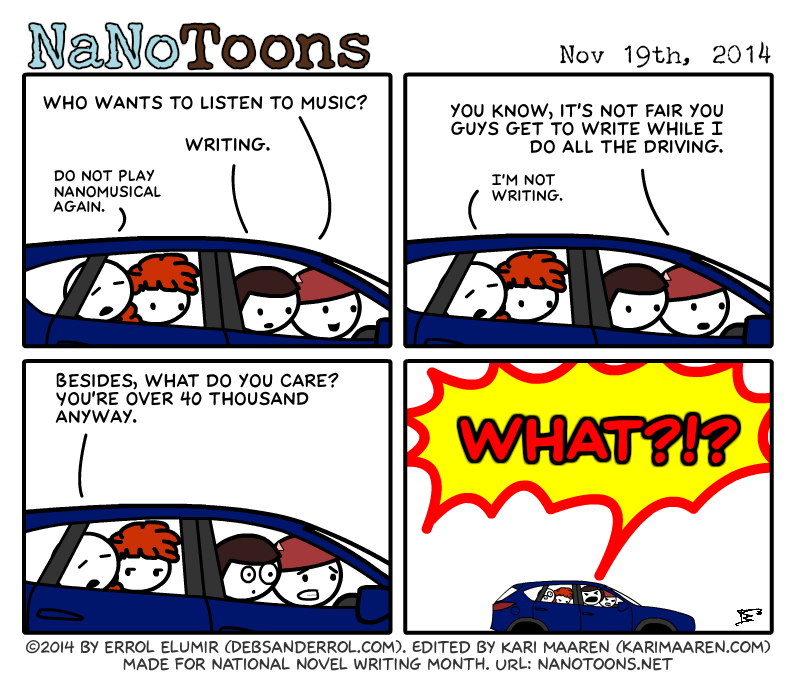 Seriously, people always assume that when you’re doing well with NaNoWriMo (or done early) then you shouldn’t care if you can get writing in every day. For some people, reaching 50k halfway through the month means they’ve finished and move on. But for plenty of people, it’s only over when the clock strikes midnight on November 30th/December 1st. And even being ahead or finished, they still have a strong desire to reach par every day, or some other goal they’ve set. To think, Rob was going to give up NaNo because he never won. Hopefully Jen’s gut reaction will give way to admiration and happiness for Rob. I’m starting to think Jen’s going to give up. There’s still so much time left! I wonder if Jen’s ever won at Nano, since it seems she’s always running behind. I always kinda thought she won at the last minute, but I don’t know if I could find evidence to back that up. I’m one of the people who does get to 50,000 for the month and that’s about how I’ve planned out my endings to be. I laughed hard at this one because I do have friends who are shocked that I’m at 40,000 right now. I’m excited to get more writing done tonight because I’m getting really close to my ending. I still hang out on forums and in chats for it until the month ends, and even after. Are you happy with how your novel is coming along, Errol? That sounds awesome! New project after project draft! My graph nearly always shoots up at the beginning of the month, levels to approximately a horizontal line, and eventually goes up steeply again at the end. I’ve decided that’s just what NaNo progress graphs have to look like and just accepted it.